Gardeners not only love tending their flowers and plants, but many also enjoy just spending time in the special space they created. What better way to do that than in a bench swing you built yourself? 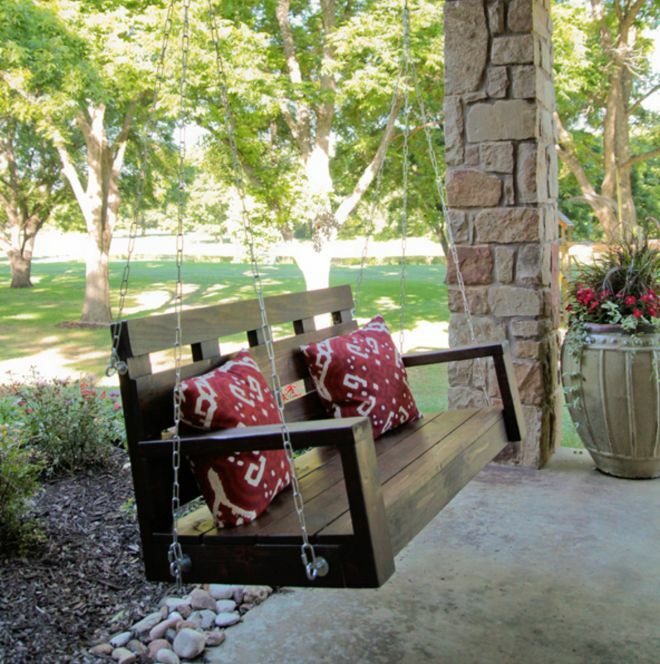 Garden swings can cost a pretty penny, but if you do it yourself you'll not only save a few bucks, but you are guaranteed to have a unique piece. Before we begin, remember that it's important to hang a garden swing properly. Today's Home Owner offers a number of tips including choosing a secure tree, attaching appropriate rope, and the proper hardware for installing the swing. 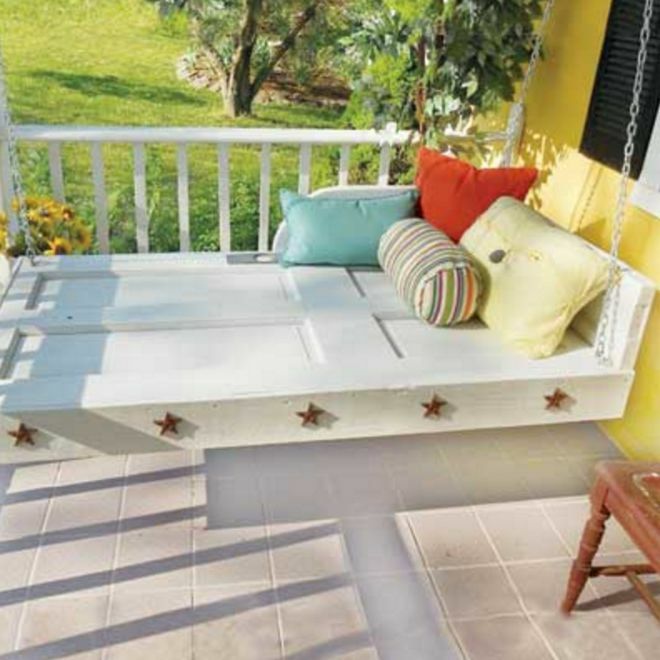 Looking for inspiration for your very own bench swing? We've found quite a few ideas! Let's take a look. 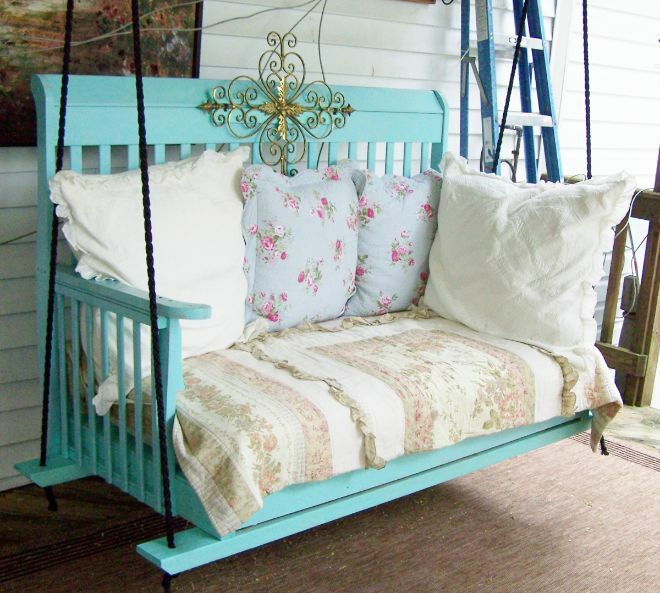 If you have a few old pieces of furniture that can't be repaired, consider reusing them for your DIY porch swing. 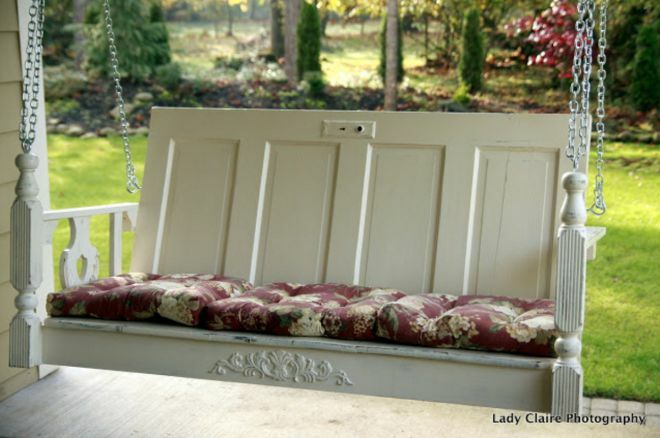 Huckleberry Lane Furniture created this charming patio swing by using pieces from an antique table and door. The great thing about older furniture is it has so much character! Those finer details really make this swing stand out. 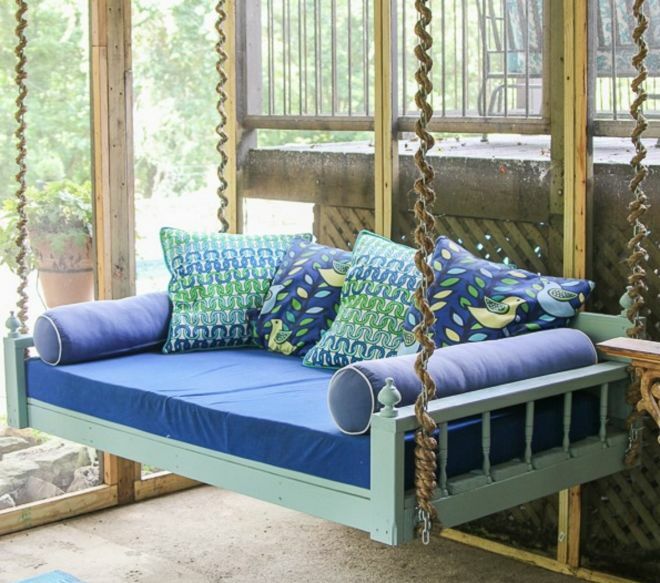 An old headboard makes for the perfect backing for a garden swing. Remember, a smaller headboard will make for a smaller seat which could be perfect for people with limited space in the patio or garden area. 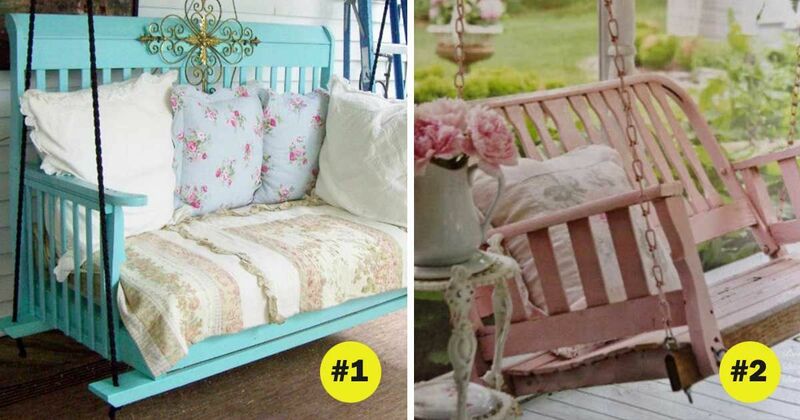 Add a bit of comfort to your garden swing by using a small mattress for cushion. What we love about this option is that you can relax or even take a nap! You can even use pallet boards for the support which makes this choice simple and economical. 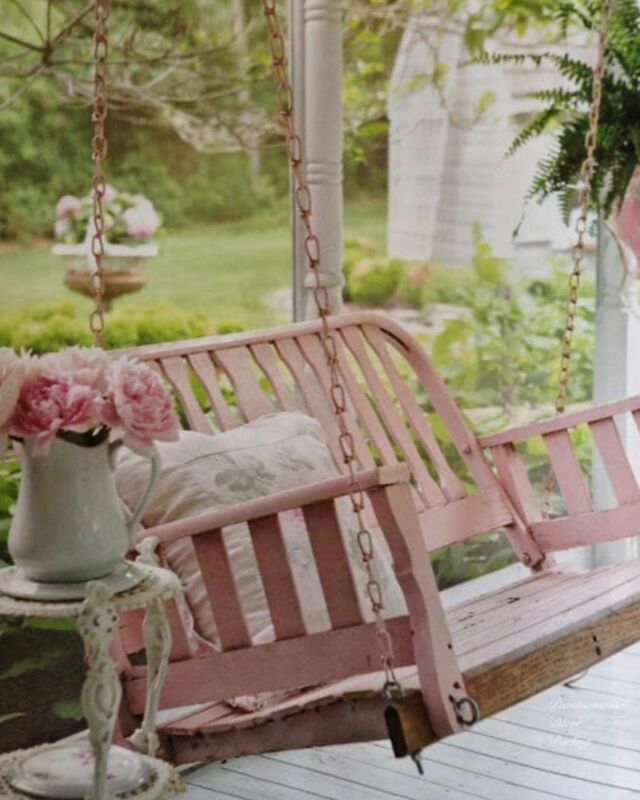 This cute one-seater swing is absolutely precious. You could even hang up several in your garden to offer additional seating for visitors. 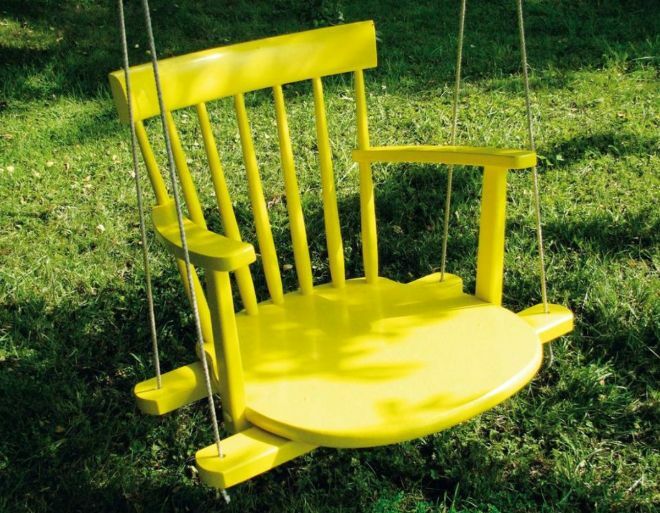 Choosing a bright color will definitely make this swing stand out. Do you have old stair rails? You can use them to create the base and arms for your patio swing. You can also use rope was to coil around the support chain which makes for a unique look. 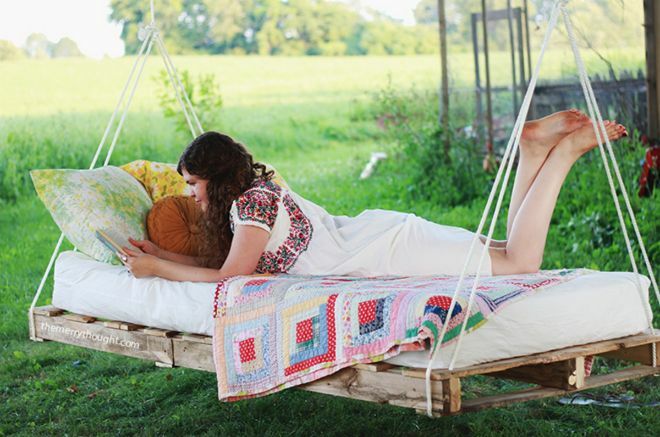 This garden swing looks simple because it was made with a basic headboard. Remember, the pieces of furniture you use will determine the overall design concept. If you stick with basic pieces then the look will be more simplistic, but if you opt for more decorative pieces your end result will be more ornate. Cribs make for the perfect size and shape for a garden swing. You can comfortable fit two people and it already has the general shape of a swing if you remove the front railing. Plus, this could be a great way to keep your child's crib around once they've outgrown it. Never underestimate the power of scrap wood. 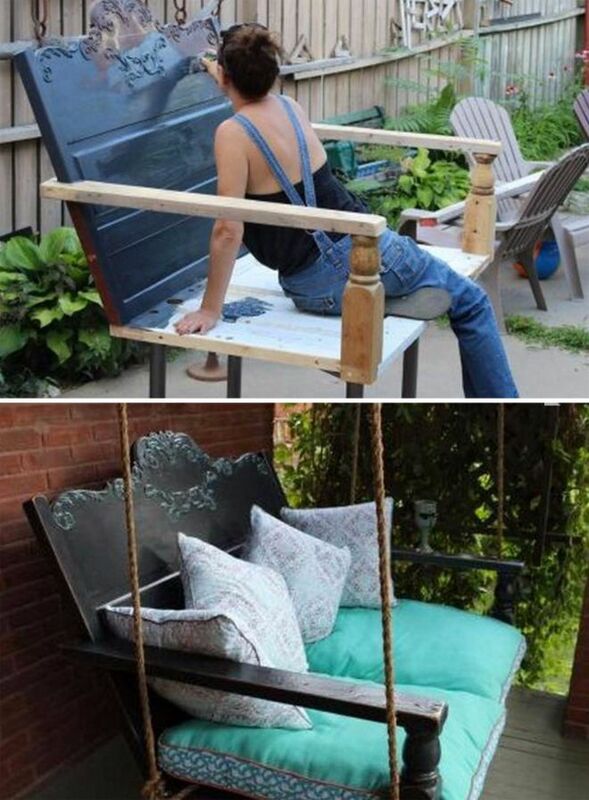 You can easily use a few pieces to make a beautiful garden swing. Add a bit of stain and you can really make the wood pop. Your garden is your refuse. Make it more comfortable with a swing! Which one will you make today? Share these ideas with your friends.